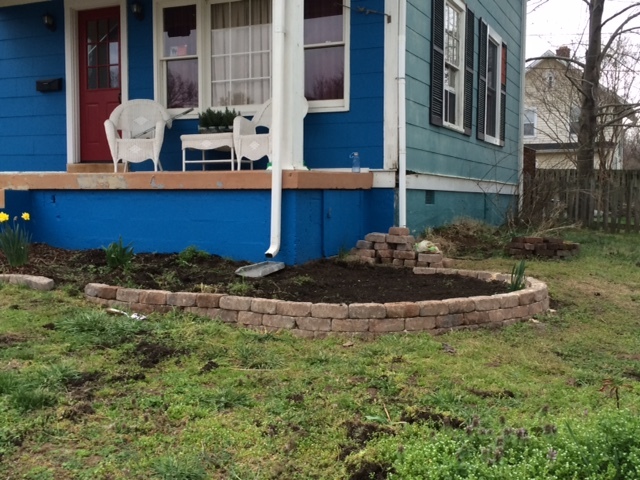 Saturday, the rain held off long enough for me to make substantial progress on the new rose garden. My roses arrived this week, and are in need of a permanent home, so time is starting to be of the essence. I have potted the own-root roses, but the bare-root roses need to be planted as soon as possible. I spent part of the day removing winter weeds from the bed, though there are still some areas left to clear. 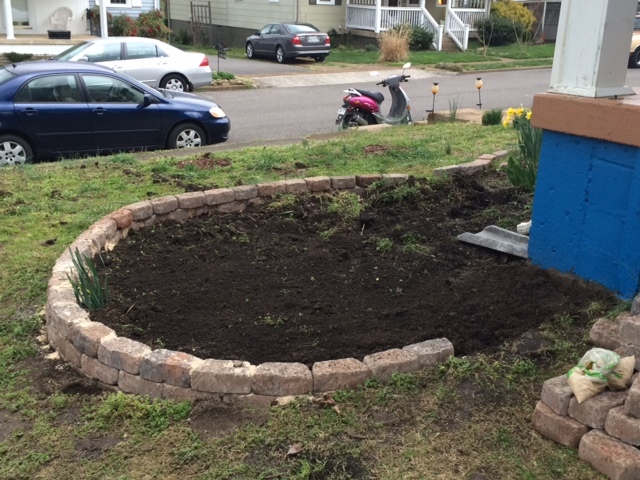 Then, I continued work on the retaining wall. 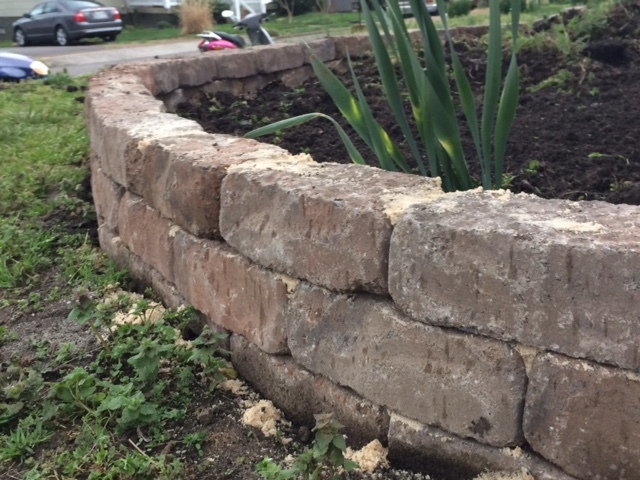 I laid several bricks for the first course last weekend. I started at the bottom of the garden. The first brick was the hardest. In order for the wall to rise seven inches, this brick needed to be placed with two inches below the ground, and only one inch exposed (the bricks are each three inches high). But the ground is quite uneven, so judging the right depth was difficult. Using my string as a guide for the height, I dug out an area for the first brick, then placed two more bricks on top to see if the height was correct. 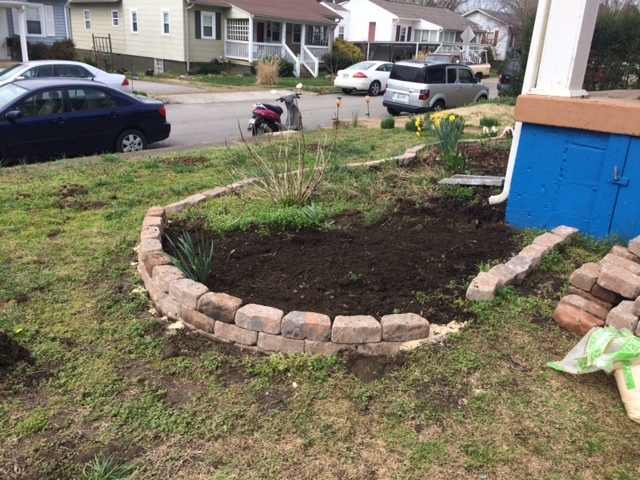 When I finally got the right depth, it was time to level the brick. Using my small level, I leveled the brick lengthwise and from back to front by tapping it with a mallet. 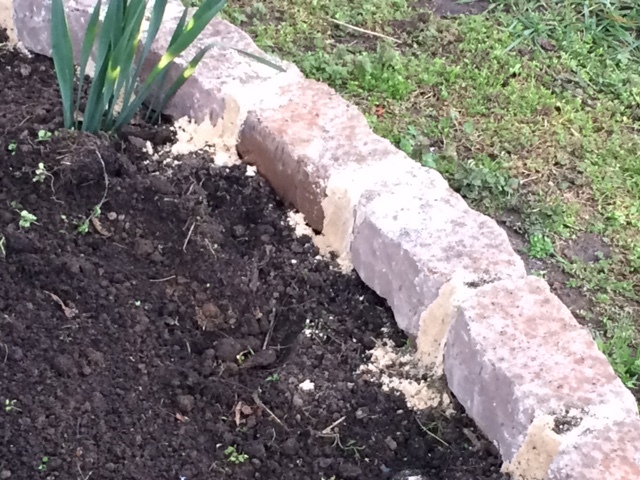 I used sand to fill and level the ground under the brick as needed. Once the first brick was level, I moved on to the next brick. Each brick had to be level back to front and lengthwise, as well as the same height as the first brick. I occasionally checked the level of the course with my long level. It was a time-consuming procedure, but necessary to make sure that the wall will be level. Since there will be two more courses on top of the first course, it is imperative that the first course be perfectly placed. With Steve’s help, we moved the hydrangea to a flower bed in the back yard. A storm took out the tree in our front yard last summer, so the hydrangea needed to be moved anyway to prevent it from frying in the summer sun. In the backyard, it will get morning sun and afternoon shade, which it should enjoy. As I laid each course, I backfilled behind the bricks with paving sand to stabilize the bricks. The soil level will be about an inch and a half below the upper edge once the bed is filled. I love the way the wall looks – weather-worn and new at the same time. 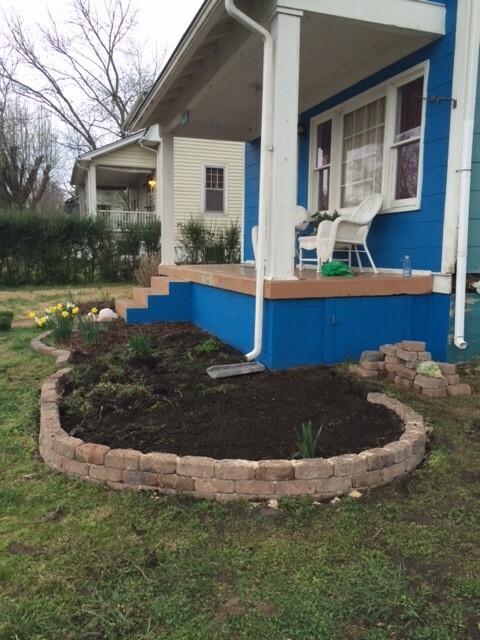 From the end of the garden bed, the wall makes the house look like it’s smiling because it knows a secret! Another couple of days of work and I should be ready for planting.